It’s the time of year that so many of us look forward to and welcome with open arms. The cold brisk air gives way to milder temperatures, we start storing away our winter boots, gloves and hats and replacing them with umbrellas and lightweight jackets, and kids bikes and outdoor furniture replace the snowblowers and shovels. As we open our windows to let in the long-awaited fresh spring air, it’s time to make a plan for a deep, thorough spring cleaning. 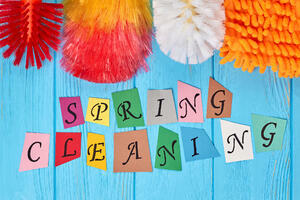 Follow the below tips for a foolproof plan to freshen up your home for a clean, fresh start this spring. Before you begin your cleaning, gather together all of the items your going to need. Be sure to have micro-fiber cloths, trash bags, cleaning products, gloves and an empty box to start. Then, go through each room and remove everything that will need to be put in the laundry. Linens, bed sheets, hand towels, curtains… though some of these items you might launder on a weekly basis, you most likely neglect others in your regular routine. Since now is the time to freshen up from top to bottom, be sure not to overlook this task. By starting the laundry before you begin to clean, you’ll be able to make your beds and hang your clean curtains when your rooms are all freshened up. Now that you have your supplies gathered and laundry started, it’s time to tackle your rooms one by one. There are some tasks that you will need to repeat in each room, such as cleaning your light switches and cleaning and windows. Be sure your supply bucket has enough cleaning cloths and disinfectants to make your way through the whole house without having to stop and load up on supplies. We all have at least one room that we hate to clean, and for many people it’s the bathroom. For that reason, I recommend you start there. Either spray down or use a mixture of baking soda and water on the areas with most grime and soap scum, including the grout and inside of toilet. While you let that set in to loosen for an easier clean, start on the easier areas. For windows and mirrors, use either just a damp micro-fiber cloth or a mixture of water and vinegar in a spray bottle and wipe down with newspaper for a streak free shine. Sprinkle baking soda in your sink and tub and use your micro-fiber cloths or a bathroom eraser for a fresh, chemical free shine. Once you’ve cleaned the rest of the bathroom, go back and scrub the tougher areas you sprayed down or used the baking soda paste on to finish up. Once you’ve finished up with the bathroom(s), make your way into the bedrooms, living area, and kitchen. Most people find that most of their high clutter areas are in these rooms. Before starting, remove all items that belong elsewhere and put them in a box for sorting and organizing later. Now is also the perfect time to purge yourself of clothes, kid’s toys, and books that are taking up space but you no longer use. Remove all toys and shoes from the floors and put away in closets, book shelves or toy boxes. Clear end tables, coffee tables, night stands, and bureaus of knick-knacks and all those other items don’t belong. Once you have removed those items that don’t belong and you’ve cleared the things you will no longer keep, its time to dive in. Remember, work from top to bottom. Dust off your ceiling fans and wipe down your walls using just warm water and mild detergent and clean each window as you go. Wipe down all surfaces with your favorite cleaning products or polish with a cloth and a small amount of coconut oil. If you have any vents, use a butter knife wrapped in a cloth or old socks and get between the vent slats to remove any built up dust and debris. Use a lint roller to remove dust and animal hair from living room furniture and lamp shades, and use a vacuum with brush attachment to get the high corners of each room and baseboards. Since the kitchen is generally the highest traffic area in the house, tackle this last and kick everyone out while you get to work. There are some areas of your kitchen that likely do not get nearly as much TLC as they should as often as they should, and that’s why spring-cleaning time is the perfect time for a deep cleanse and fresh start. As you did in the bathroom, wet down your sink and sprinkle with baking soda to soak while you get busy on the rest of the kitchen. While the baking soda is hard at work in your sink, put a bowl of approximately ½ to 1 cup water and the juice of a lemon in microwave and turn on high for three minutes. Let it stay in the microwave for at least an additional 3-5 minutes then wipe down with a clean cloth. The citrus will remove any odors and will loosen any grime for easy cleaning. Now give your cabinets and backsplash a thorough cleaning. You might be surprised how fresh they look once you remove grease and grime from cooking, steam and splatter. Move on to your table and chairs, baseboards and walls just as you did in the other rooms. Next, tackle your refrigerator. Remove all food and condiments and get rid of stuff that’s been sitting in there since last spring. Wipe down all drawers and shelves with warm sudsy water and dry thoroughly before putting back all things your keeping. To clean your appliances and countertops, spray down with an all purpose cleaner or sprinkle a small amount of the trusty baking soda and scrub with a lemon. The citrus combined with the abrasiveness of the baking soda with cut through the tough spots that water and dish soap can’t penetrate. Once all areas are scrubbed and shining, go back and wipe down your sink thoroughly. If you have a garbage disposal, throw your used lemons in with a bit more of baking soda and coarse salt to get rid of any lingering odors and to clear out any small food particles that might be stuck in there. The final step in your cleaning will be to vacuum and wash your floors. For anyone staying away from chemicals, you can use a mop with hot water and a drop or two of your favorite essential oil for that fresh, clean smell on your tile floors. You’ve now scrubbed and polished each room from top to bottom and laundered all your bedding and linens… now sit back and enjoy the spring air in your freshly cleaned home and congratulate yourself on a job well done!